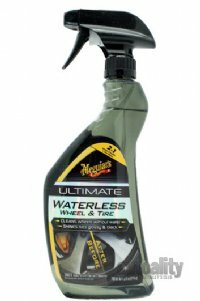 Provides a quick and convenient solution to maintaining complete vehicle cleanliness without water. Clean your wheels without water and dress your tires all at once. Strong enough to power through brake dust and road grime on wheels. Leaves behind a medium level gloss on tires. Simply spray your wheels and tires; wipe down your wheels, but leave your tires alone for a dark, rich shine - that's it!